We have prepared AWS Solutions Architect Associate (SAA-C01) certification sample questions to make you aware of actual exam properties. This sample question set provides you with information about the AWS-SAA exam pattern, question formate, a difficulty level of questions and time required to answer each question. 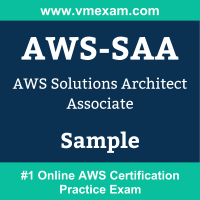 To get familiar with AWS Certified Solutions Architect - Associate exam, we suggest you try our Sample AWS SAA-C01 Certification Practice Exam in simulated AWS certification exam environment. To test your knowledge and understanding of concepts with real-time scenario based AWS SAA-C01 questions, we strongly recommend you to prepare and practice with Premium AWS-SAA Certification Practice Exam. The premium AWS-SAA certification practice exam helps you identify topics in which you are well prepared and topics in which you may need further training to achieving great score in actual AWS Certified Solutions Architect - Associate exam. 01. An application saves the logs to an S3 bucket. A user wants to keep the logs for one month for troubleshooting purposes, and then purge the logs. What feature will enable this? a) Adding a bucket policy on the S3 bucket. b) Configuring lifecycle configuration rules on the S3 bucket. c) Creating an IAM policy for the S3 bucket. d) Enabling CORS on the S3 bucket. 02. A company is developing a highly available web application using stateless web servers. Which services are suitable for storing session state data? 03. An application requires a highly available relational database with an initial storage capacity of 8 TB. The database will grow by 8 GB every day. To support expected traffic, at least eight read replicas will be required to handle database reads. Which option will meet these requirements? 04. Company salespeople upload their sales figures daily. A Solutions Architect needs a durable storage solution for these documents that also protects against users accidentally deleting important documents. Which action will protect against unintended user actions? a) Store data in an EBS volume and create snapshots once a week. b) Store data in an S3 bucket and enable versioning. c) Store data in two S3 buckets in different AWS regions. d) Store data on EC2 instance storage. 05. A Solutions Architect is designing an online shopping application running in a VPC on EC2 instances behind an ELB Application Load Balancer. The instances run in an Auto Scaling group across multiple Availability Zones. The application tier must read and write data to a customer managed database cluster. There should be no access to the database from the Internet, but the cluster must be able to obtain software patches from the Internet. Which VPC design meets these requirements? 06. A Solutions Architect is designing a critical business application with a relational database that runs on an EC2 instance. It requires a single EBS volume that can support up to 16,000 IOPS. Which Amazon EBS volume type can meet the performance requirements of this application? 07. An organization is building an Amazon Redshift cluster in their shared services VPC. The cluster will host sensitive data. How can the organization control which networks can access the cluster? a) Run the cluster in a different VPC and connect through VPC peering. b) Create a database user inside the Amazon Redshift cluster only for users on the network. c) Define a cluster security group for the cluster that allows access from the allowed networks. d) Only allow access to networks that connect with the shared services network via VPN. 08. A company is storing an access key (access key ID and secret access key) in a text file on a custom AMI. The company uses the access key to access DynamoDB tables from instances created from the AMI. The security team has mandated a more secure solution. Which solution will meet the security team’s mandate? a) Put the access key in an S3 bucket, and retrieve the access key on boot from the instance. b) Pass the access key to the instances through instance user data. c) Obtain the access key from a key server launched in a private subnet. d) Create an IAM role with permissions to access the table, and launch all instances with the new role. 09. An application running on EC2 instances processes sensitive information stored on Amazon S3. The information is accessed over the Internet. The security team is concerned that the Internet connectivity to Amazon S3 is a security risk. Which solution will resolve the security concern? a) Access the data through an Internet Gateway. b) Access the data through a VPN connection. c) Access the data through a NAT Gateway. d) Access the data through a VPC endpoint for Amazon S3. 10. A web application allows customers to upload orders to an S3 bucket. The resulting Amazon S3 events trigger a Lambda function that inserts a message to an SQS queue. A single EC2 instance reads messages from the queue, processes them, and stores them in an DynamoDB table partitioned by unique order ID. Next month traffic is expected to increase by a factor of 10 and a Solutions Architect is reviewing the architecture for possible scaling problems. Which component is MOST likely to need re-architecting to be able to scale to accommodate the new traffic?